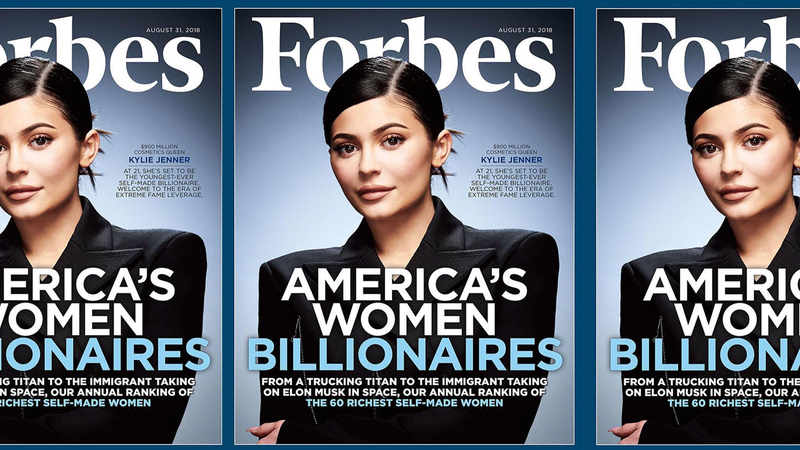 Despite What Forbes Wants You to Believe, Kylie Jenner Ain't That "Self-Made"
Kylie Jenner, the youngest of Kris Jenner’s brood of wealthy ladies, is on the cover of Forbes, dressed in a sharp-shouldered blazer like a small child playing dress up, smiling an inscrutable grin. The accompanying article promises to tell us how Kylie Jenner made almost $900 million in three years. To their credit, Kris Jenner’s name shows up nine times. What the piece does contain are soft truths about how Kylie made the $900 million fortune that landed her on the cover. The cosmetics company she launched two years ago with just a lip kit has blossomed into an empire, which Forbes values at $800 million, and Jenner is the sole owner of the company, meaning she’s a very wealthy woman. But she does owe much of her “self-made” wealth to her mother, Kris Jenner, whose evil genius for marketing her children and creating a capitalist empire around their image deserves far more shine here. Jenner’s cosmetics empire is nothing to sneeze at and it’s clear why she’s the cover of this Forbes package, which features other self-made women like Oprah Winfrey, Meg Whitman, Tory Burch, and Diane Hendricks, a 71-year-old billionaire from Wisconsin who runs a roofing, siding, and windows empire. However, the definition of “self-made” and what it means in relation to the women on this list seems to be a matter of semantics. Self-made as a phrase conjures a Horatio Alger-esque vision of a woman rising from nothing and clawing her way to the top through hard work, perseverance, and grit—starting from the bottom and ending up at the glittering professional peak. While Jenner’s cosmetics empire is indeed her doing, she was hardly a scrappy little thing. As the youngest child of an already booming empire, Jenner grew up on television and was born into wealth; her struggles to get her business up and off the ground were eased greatly by her family’s wealth. Had Jenner been born into any other family to anyone other than Kris Jenner, a savage businesswoman with an eye for making money, who knows how successful Kylie would actually be? The ideas behind her cosmetics company were purely her own, but the guiding hand that steered her in the right direction was none other than her momager, who pockets a tidy 10 percent of her children’s earnings. The sisters deserve the credit, too, but don’t be fooled by this framing.